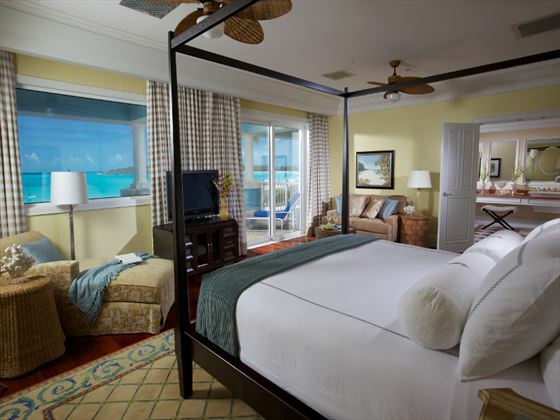 Located in a luxurious enclave in the Exumas, Sandals Emerald Bay is a dose of paradise in a stunning setting. Enveloped by 500 acres of exotic foliage, the surroundings here set the scene for a peaceful and indulgent holiday. The resort itself is sophisticated and elegant, with contemporary décor, fantastic facilities and seven spectacular restaurants. 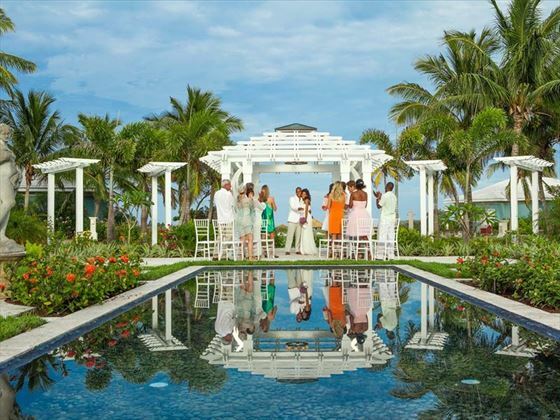 This is the perfect choice for couples seeking a peaceful getaway – the resort is designed to make you feel as though you’re on your own private island, creating the ultimate romantic escape. 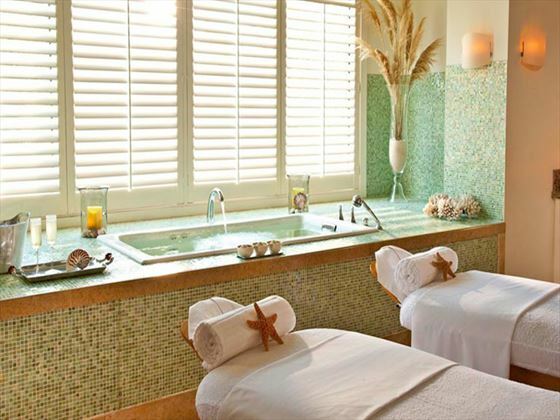 There’s a strong attention to detail here, from the 18-hole championship golf course designed by golf pro Greg Norman to the decadent Red Lane Spa where you can treat yourself to a pampering massage or facial. 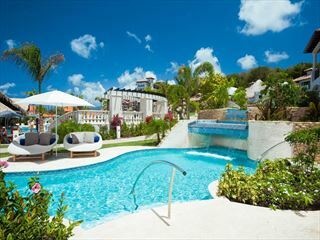 The resort is home to the largest swimming pool on the island, spanning more than half an acre, as well as impressive rooms with attractive furnishings and luxurious features. 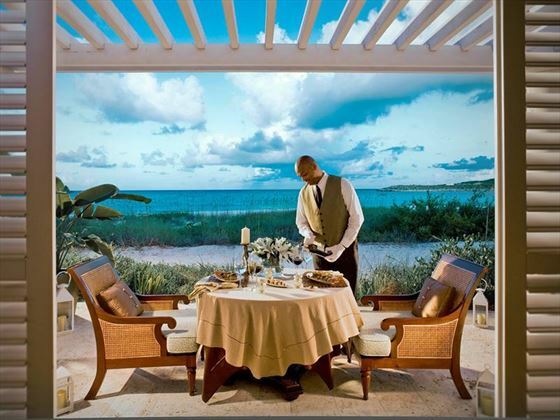 Our sales team believe the beach here is the best in the Bahamas, offering picture perfect views of white sands and azure waters. 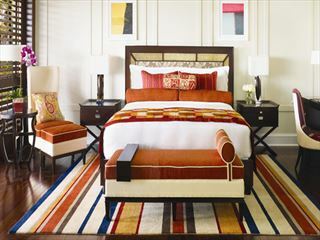 Guests here receive the Luxury Included package. 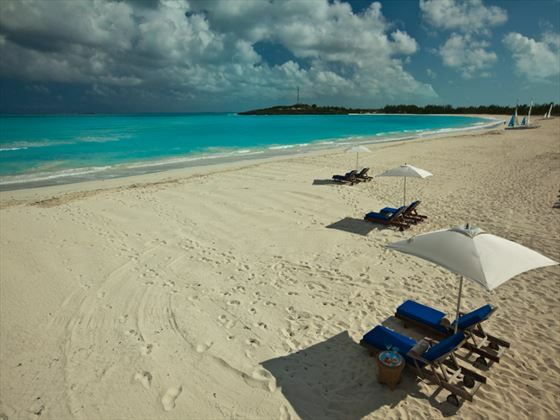 Set on a mile-long beach, Sandals Emerald Bay enjoys a great location on Great Exuma with stunning ocean vistas and azure waters. 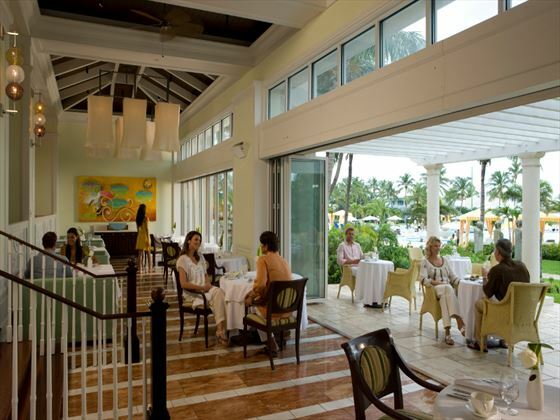 The area surrounding the resort is secluded and tropical for a quintessentially Bahamian adventure. 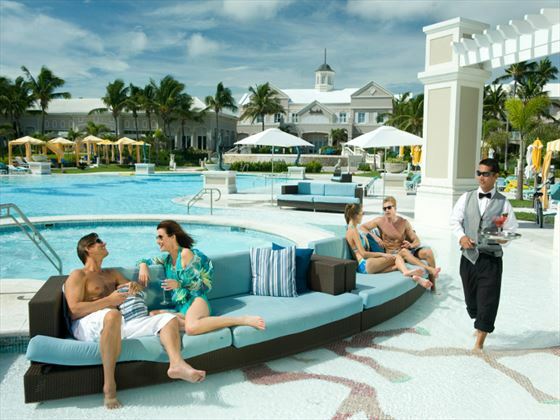 Fly into Nassau or Miami and take a flight with Bahamas Air to George Town, followed by a brief transfer to the resort – the flight from Nassau is approximately 40 minutes. 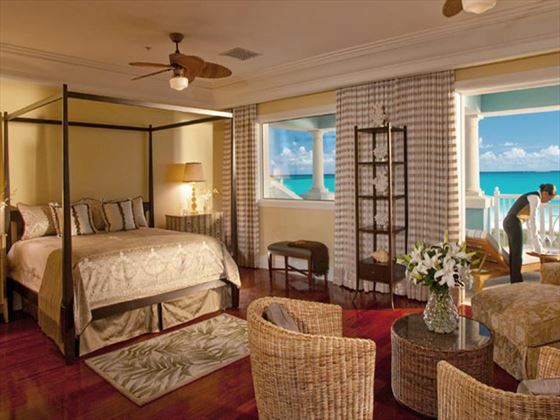 The resort features 249 villas in two categories – Butler or Concierge. 24hr personal butler trained by Guild of Professional English Butlers, available to cater to your every need from drawing a rose petal bath at the end of your day to arranging activities, confirming dinner reservations and packing or unpacking your luggage. Breakfast, lunch, dinner, snacks, unlimited premium drinks, cocktails and signature drinks, juices, sodas, selection of wines, watersports including motorised watersports, nightly entertainment and scuba diving. 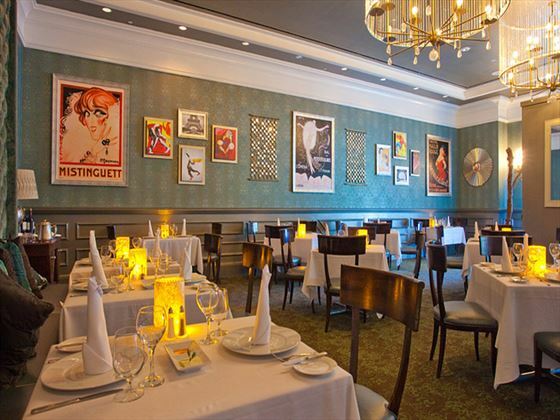 Il Cielo – fine Italian cuisine served in an elegant venue. Reservations essential for dinner. The Jerk Shack - A laidback, thatched roof shack serving delicious Jamacian style cuisine, with plenty of jerk-marinated dishes. Bombay - A colourful Indian restaurtant serving aromatic Bombay-style cuisine, enjoyed in an authentic setting and cooked with a variety of delicious spices. Soy - A contemporary sushi bar offering delactable sushi favourites, including sashimi. Kimonos - A mouthwatering restaurant serving a variety of Japanese favourites alongside a cool and contemporary setting. 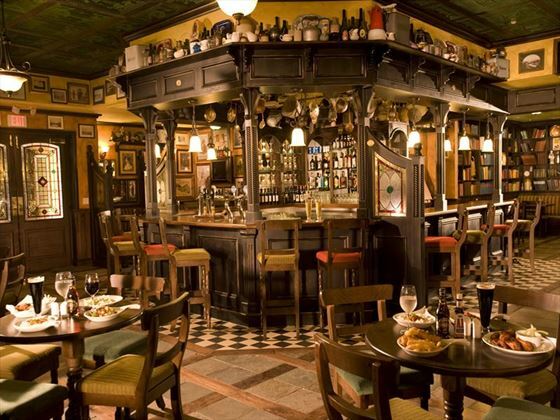 Also, a choice of bars serving premium spirits. When dining, closed in shoes must be worn, bathing suits must be covered and men must not wear tank tops or sleeveless shirts. After 6.30pm men have to wear long trousers and women have to wear dresses, trousers or culottes (no shorts or short outfits). Curtain Bluff is on the southern tip of the island on a peninsula, surrounded by two beautiful sandy beaches, one is calm, ideal for swimming and watersports and the other beach is washed by ocean surf. 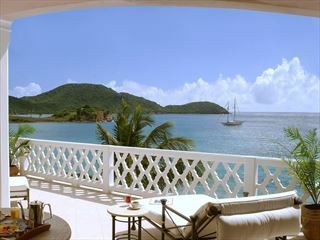 Curtain Bluff is 35-minutes drive from VC Bird International Airport. A lovely adults-only resort located on the stunning sands of Pink Gin beach. 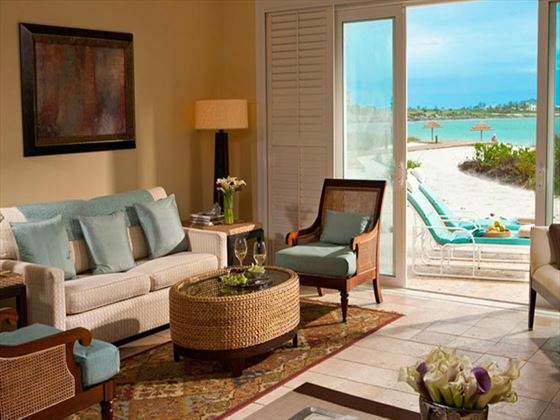 Recently taken over and renovated by the Sandals group, it is ideally situated close to the airport and only a short drive away from St George’s.